The structure indicated is the extensor carpi radialis brevis muscle of the forearm. 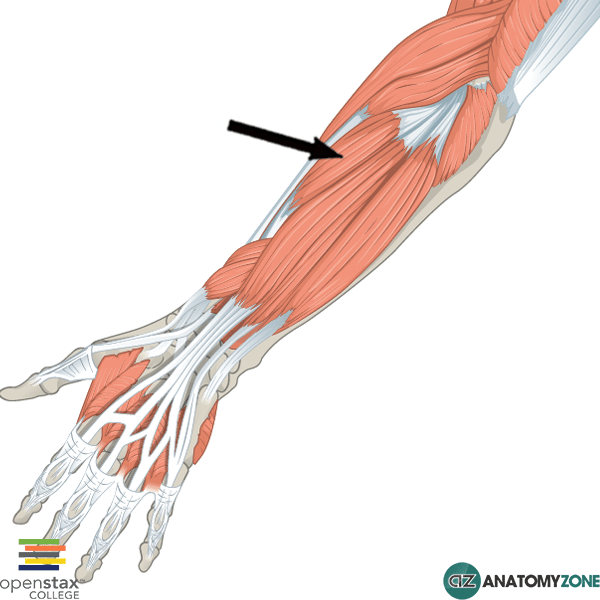 The extensor carpi radialis brevis muscle is one of 7 muscles located in the superficial compartment of the posterior forearm. The posterior forearm consists of a superficial and a deep compartment. The superficial compartment contains 7 muscles, whereas the deep compartment contains 5 muscles. The extensor carpi radialis brevis muscle serves to abduct and extend the wrist joint. The muscles of the posterior compartment of the forearm originate from the lateral epicondyle of the humerus and the supraepicondylar ridge and they are all innervated by the radial nerve, they generally extend the wrist joint.